Big Walnut’s Nathan Lawyer (4) is congratulated by teammates Wes Coey (54) and Josh Hageman (50) after scoring a touchdown in the first quarter of Friday’s non-league showdown against visiting Buckeye Valley. 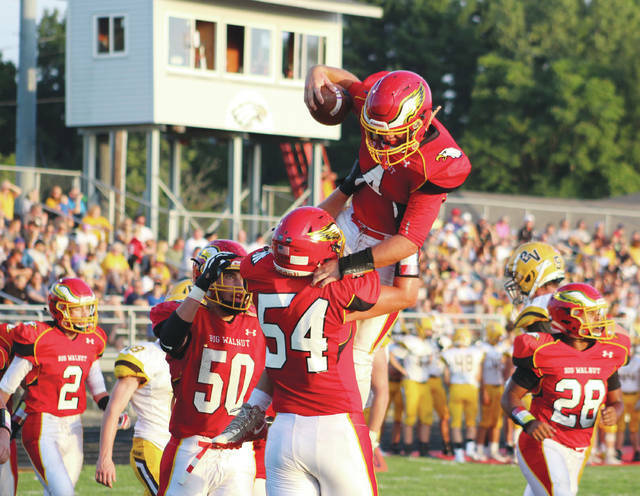 In a complete turnaround from its first game, the Big Walnut football team jumped out to a 21-0 lead and held off a Buckeye Valley second-quarter rally on its way to a 42-28 non-league win Friday night in Sunbury. Jagger Barnett hooked up with Sam Elliott for a 56-yard touchdown, Jakob Daniels found daylight around the left side for a 48-yard touchdown run and Nathan Lawyer added a 4-yard run as the Golden Eagles jumped out to a 21-0 lead with 6:30 left in the opening frame. BW found itself on the other side of that score a week ago against Johnstown-Monroe. BV needed a pair of fourth down conversions to finally get going on its third drive. Up-back Andre Ash took a snap in punt formation and ran 12 yards on fourth-and-1 and Duncan Faulk converted a 13-yard run on fourth-and-one on the next set of downs to set up a Grant Owens to Will Weinberg 15-yard touchdown with 1:43 left in the first. Zach Gerber broke free up the middle and ran 53 yards to cut the Baron deficit to seven with a little over nine minutes left in the half. But, Daniels came up big again for the Eagles … this time on the defensive side of the ball. He leaped and snagged a Grant Owens pass at midfield with 41 seconds left in the half. Barnett found Cohen Andreini on a post for 47 yards to set up a Tyler Crotinger 2-yard touchdown run a couple of plays later to push the BW lead to 28-14 at the break. BW added a 4-yard run and a 45-yard touchdown from Barnett to Montgomery in the third to push the lead as high as 28. Owens connected with Duncan Faulk on an 83-yard touchdown for the Barons (0-2) that made it 42-21 with 2:21 left in the third. Owens would add a 12-yard touchdown to Beau Ewing in the fourth to account for the final margin. It was the first meeting between the schools since 1997. BW hosts Dublin Scioto while BV heads to Mount Vernon in non-league games next week. Both games are scheduled for 7 p.m.